Metal teepee art is like a whimsical Native American Indian village scene for your wall. Talk about a unique piece of metal wall art. 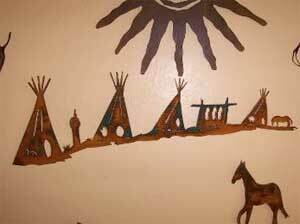 You can also combine this piece of tipi art with other metal wall sculptures to create a unique scene of your own. For instance, you can combine it with the endearing long legged horse metal art scuplture (as shown above) or metal sun wall art shown above or horse metal wall art. Be sure to pay attention to the dimensions of each piece to make a scene that is pleasing to the eye (Metal sun and horse pictured above are not included in the price). Each piece of tipi art is cut and finished by an artist. Measures 45 inches wide x 14 inches high. Available in rust as shown. Can be hung indoors or outdoors. (If you hang the metal wall art piece outdoors, you may want to seal it every couple of years to protect the wall.) Comes ready to hang. Order to delivery time is about 4 weeks. Due to variations in temperature and humidity when we finish the piece, variations in color may occur. Order your teepee art metal wall sculpture today.